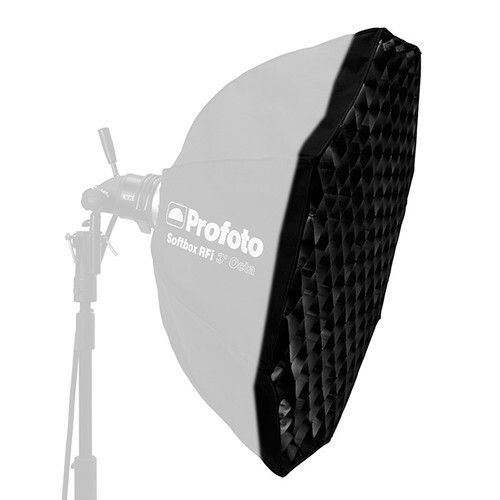 This Profoto 50° Softgrid for 3.0' RFi Octa Softbox is an ideal way to direct and control the light output of your Light Shaping Tool. Collapsible, portable, and extremely lightweight, fabric grids have no supporting frame of their own. These grids hook-and-loop to all sides of the recessed front area to provide a controlled beam spread. Once the job is complete, just detach and fold it down to a fraction of its size and store it in the included fabric bag. Box Dimensions (LxWxH) 19.05 x 14.65 x 2.7"
50° Softgrid for 3.0' RFi Octa Softbox is rated 4.7 out of 5 by 9. Rated 5 out of 5 by houghton foto from Simple, very effective tool Quickly helps manage light when you only want it on your subject. Necessary piece for me and its quick to set up and break down when on location. Rated 4 out of 5 by Photography by David from A must to control the light. A good addition for the 3ft Octa to help control light spill. Pricy as all grids typically are, but what else you going to do. Great job at controlling and directing your light. Rated 5 out of 5 by Richard from Really nice light control I love this control it keeps light from splashing everywhere ! So easy to attach and remove too Love it ! Rated 5 out of 5 by CTM Photo from Profoto Softgrid Looks great and works great...little expensive, but it is a Profoto product. Rated 5 out of 5 by Larry R. from Great softbox Fabulous softbox, very well-made and great quality.